Whiteboard is an important fixture in classrooms, offices, meeting rooms, and other educational, business and work environments to display data content, convey knowledge and share ideas. On computer, there are software applications that simulate virtual whiteboards too so that users can write text or draw images on a simulated canvas, with some even supports interactive whiteboard where multiple users can collaborate. Microsoft Whiteboard is a virtual collaborative whiteboard app for Windows 10 devices. With Microsoft Whiteboard, users can type text, create drawings, design charts, show presentations with images and more, and share them with other users or edit them simultaneously. The projects can be easily integrated into Microsoft’s Office solutions or the group chat app Teams. Best of all, the Whiteboard app is free and available to all Windows 10 users from Microsoft Store. Create freely, work naturally – Transform your work into professional-looking charts and shapes on an infinite canvas with an interface designed for pen, touch, and keyboard. Collaborate in real time, wherever you are – Bring your team together on the same virtual canvas, around the world and across devices. 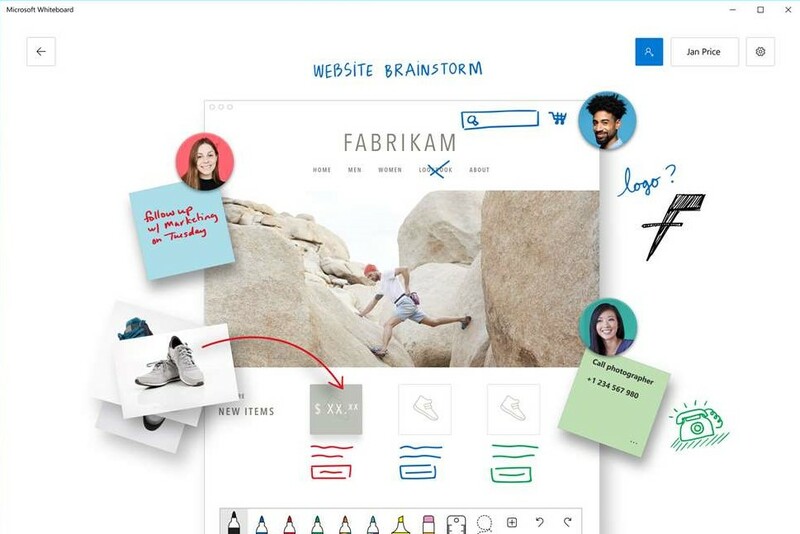 Brainstorm simultaneously in the Whiteboard app or from your browser window. Save automatically, resume seamlessly – Your whiteboards stay safe in the cloud until you’re ready to return to them, from the same or another device. Download Microsoft Whiteboard from the Microsoft Store. To use Microsoft Whiteboard, you have to log in with your Microsoft account (Outlook, Hotmail, Live, Xbox, etc.) or Office 365 account (work or school). Currently, Microsoft Whiteboard is available in English only, but it will available for other languages in the next few months. In addition, Microsoft Whiteboard will also be available for iOS and the Web (through web browser without downloading app) soon.